Most of us, these days, have a space at home devoted to work: a home office, a studio, or just a simple desk in the corner of a room where we retreat to concentrate or create. Far from being places of discontent and drudgery, workspaces at home should be a form of refuge, a place where an active mind can sharpen its skills surrounded by the comforts of home. 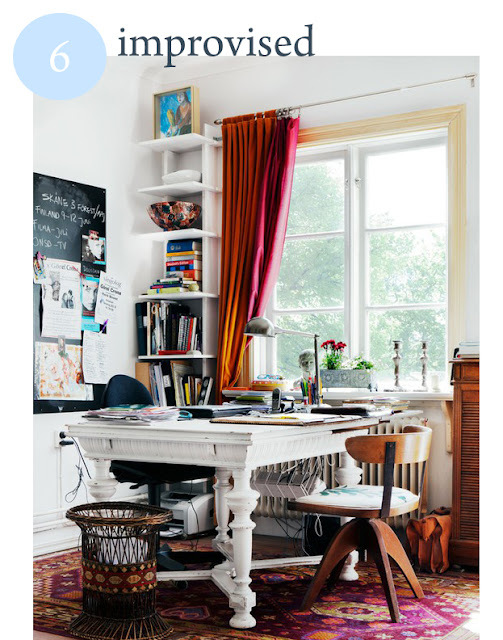 For this reason, home workspaces really ought to be given the style treatment they deserve with emphasis on organization and inspiration. MarthaStewart.com has numerous helpful ideas and tips for creating a functional home office and I suggest you check them out! 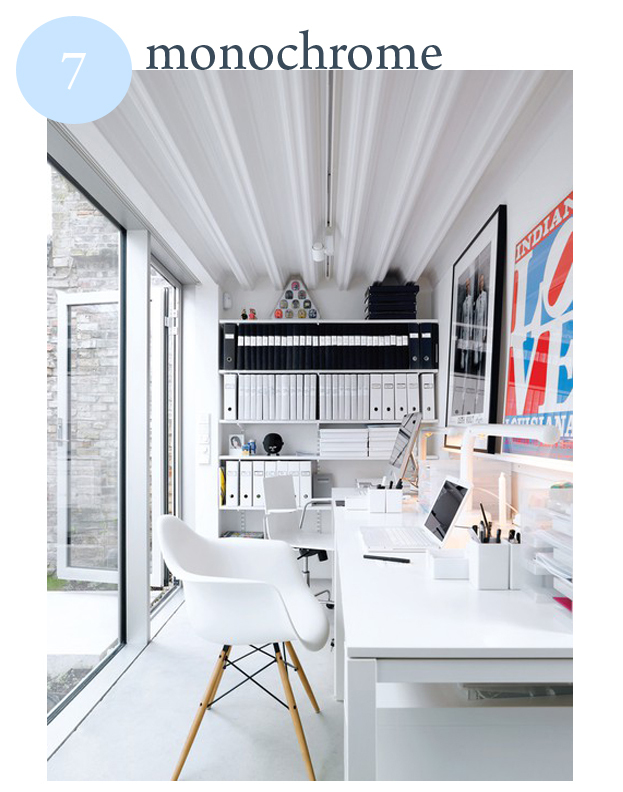 Below are images I've gathered of home office spaces for a number of different personalities and functions. Many of the images express an artistic edge while others are more straightforward, but I think they are all inspiring, each in their own distinctive way. I hope you think so too! This home workspace really is stunning. An unused corner of a room is put to task with an eclectic mix of found and vintage furniture to create a look that is bold and modern, bright with personality and charm. 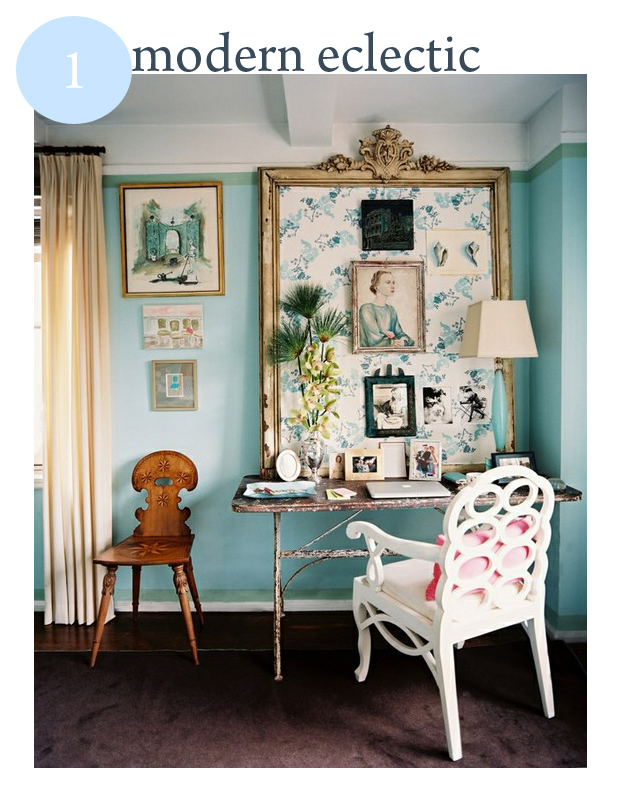 I love the use of that enormous frame to create a bulletin board with patterned fabric stretched over board. The colours make the space feminine and inviting. The overall effect is quite glamorous! This workspace causes me to sigh ever so slowly. Its serenity stems from the neutral colour palette of gray and tan, as well as the airy height of the ceilings, the long, clean lines and the soft light from the window. It is clean and open and organized, perfectly conducive to the pursuit of higher achievements. 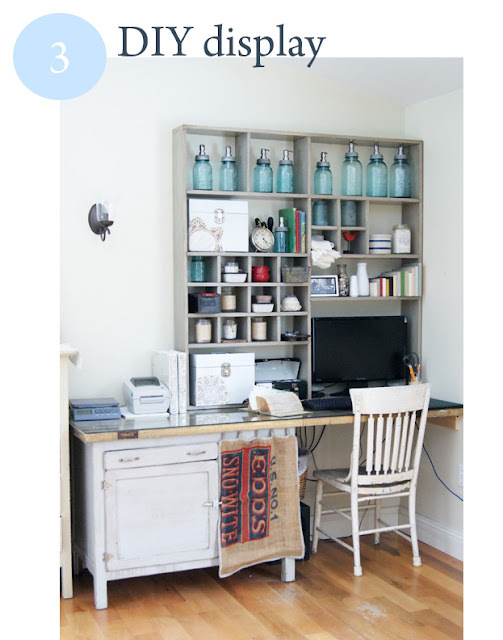 I love the DIY element to this space: a small white hutch is expanded with a long work top and further enhanced by a handmade shelving unit for display. It is whimsical and crafty, perfect for someone who enjoys being surrounded by collections and sentimental objects. 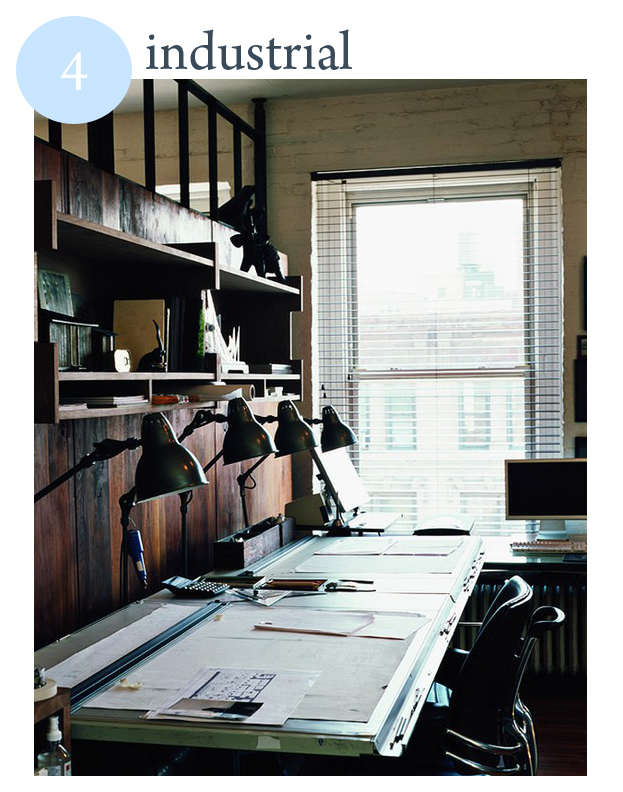 This space is clearly designed for a draftsman of some sort with a long art table. I love the multiple task lamps and the placement of the computer by the window. The warmth of the dark wood and the painted brick keep the area from feeling too office-like. 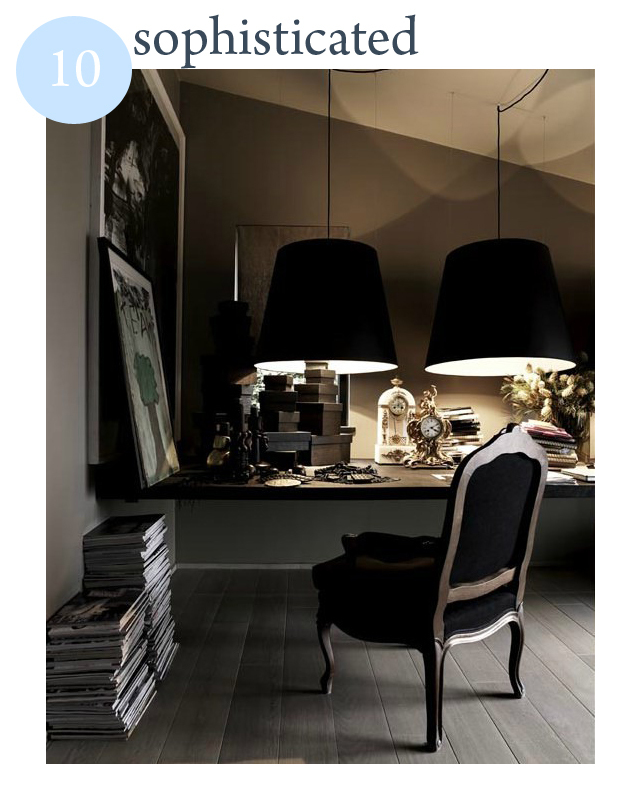 It's a masculine space that still retains a sense of elegance through its sleekness and practicality. I picture a traveling couple planning their next far-flung excursion at this desk. The double-sided feature of the desk allows two people to face each other while they are working. 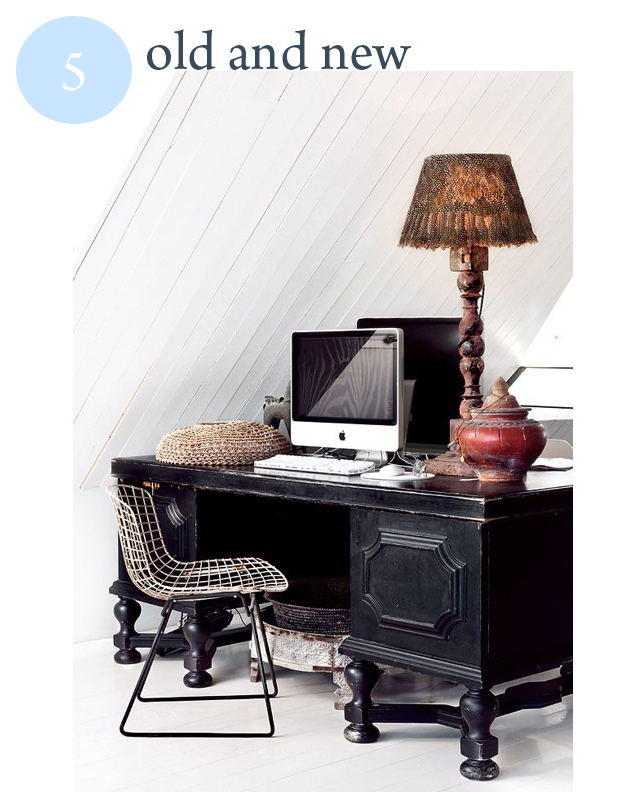 The black desk contrasts beautifully with the white room, just as the vintage treasures placed on top of the desk contrast the new technology. Still, there is a sense of harmony and a great sense of fun. This space is a tribute to improvisation! A dining room table painted white is casually butted up against a large window in a bright, spacious room to create this active corner. A narrow column of book shelves and a chalk-board bulletin form a task-oriented backdrop. The mix of furniture is decidedly haphazard but it all works because of the anchoring use of white and the exciting feeling of activity. The space is not static. This is clearly a space for a highly organized individual. 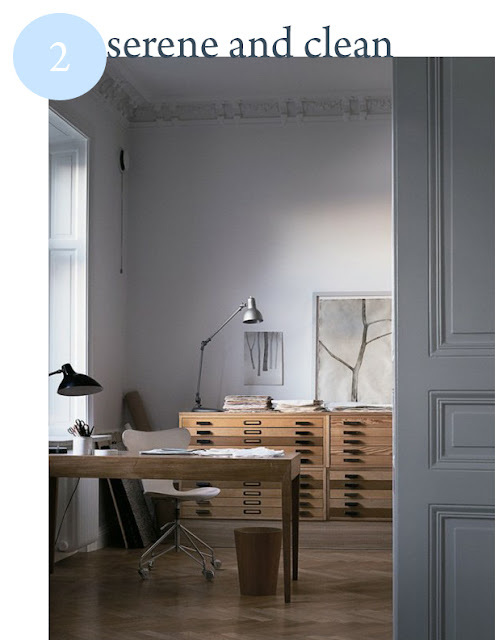 I love the use of white, right down to the floor, which gives the room a monochromatic feeling of unity. The placement of the workspace near a set of doors that lead outside is perfect when you need a head-clearing breath of fresh air. The feeling of the space is efficient but not intimidating. Magazines and files are kept organized on wall-to-wall shelves while art and photography lend a personal touch. 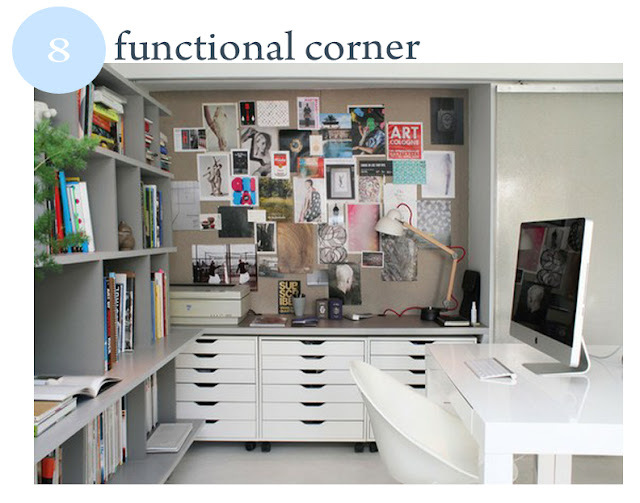 This functional corner seems to do it all and is for an organized multi-tasker: a home library on one wall, a craft table with plenty of storage drawers topped by an inspiring wall-to-wall bulletin board on another and a clean, minimalist desk devoted to a single task. Take your pick! Each area of the space functions as its own defined setting and yet it all works together as a single unit. Artists have a hard time of things. Creating artwork at home can result in plenty of mess, and yet having a space at home to create is essential to an artist's livelihood - and sanity! 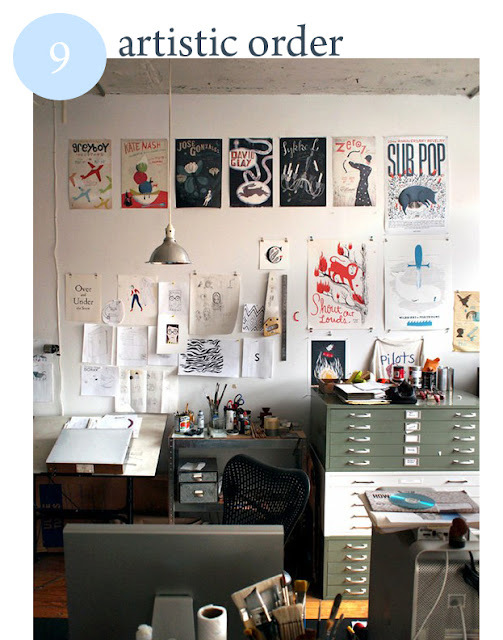 This studio space does a great job of maintaining order while still displaying a creative spirit. Tools and brushes have designated jars, drawers are labeled and wall space is put to good use. Dark, sleek and sophisticated are words that define this workspace, which is illuminated by a pair of gorgeous hanging lamps. A serious collector works here - catalogs at the ready - or perhaps an editor or a designer. The use of black and dark gray is far from being depressing; it is a warm but intense space that is stimulating and comfortable. These were so great, I think I liked them all the same (which never, ever happens!). And Rowaida was pinning them as well, and I am about to repin them too!